You all know I'm a huge J.Crew fan; My work wardrobe is pretty much a solid 50/50 split of J.Crew and Zara. It's serious. And now, it's going to get even more serious: J.Crew is finally opening in my city this week and I'm about to get very, very poor. In anticipation of blowing a bunch of cash within moments of stepping in the door, I've done a bit of pre-shopping to get an idea of what I'd like to buy (instead of being distracted by pretty but totally unreasonable items). These are three outfits I'd at least like to try on together - as fun as Polyvore is, clothes inevitably look different on every individual body - and that aren't stupidly expensive. This is especially the case in the event of a "grand opening" sale (which would be welcomed) (hint hint hint to J.Crew, Chloë wants needs a sale). One of the main things I'd like to invest in this fall is a new blazer. I've seen the Schoolboy blazer styled on various blogs and it looks absolutely perfect for me and my work style. Classic and chic. It's not crazy expensive either in the grand scheme of things. Someday I'd love to own a really luxe blazer from a brand like Smythe, but my bank account just isn't there yet. So J.Crew will have to suffice. Another item on my list this fall is a skirt (or two). My two favourite skirts for work are J.Crew's No.2 Pencil skirts, but they're now two years old and have always been a tad large. It's time for something new. I love pencil skirts for work, but I'd also like to try experimenting with other shapes and silhouettes. That way a skirt could do double-duty and be wearable on weekends as well. I'd also like to update my work-flats situation. I'm pretty set for heels, although I wouldn't say no to a great deal on a new pair, but my current flats are getting a big ragged and old. And to be honest, they're a bit boring with their simple black leather. Time to upgrade to something a little more fun. The new store is set to open after my no-buy ends, so keep an eye out for some shopping confessions and outfits on here and on my YouTube channel. 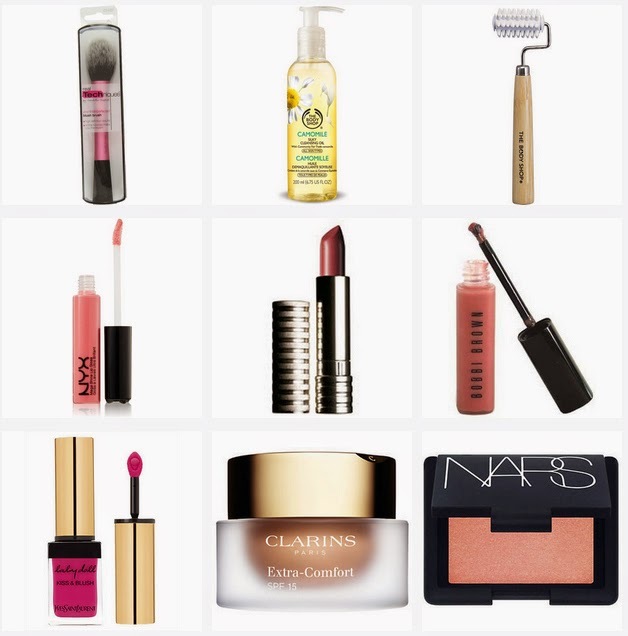 Fingers crossed my pre-shopping faves end up being as lovely in real life! What are you looking forward to buying this fall? Anything special on your wishlist? I never thought I'd make it this far, but here I am, more than halfway through my August no-buy. 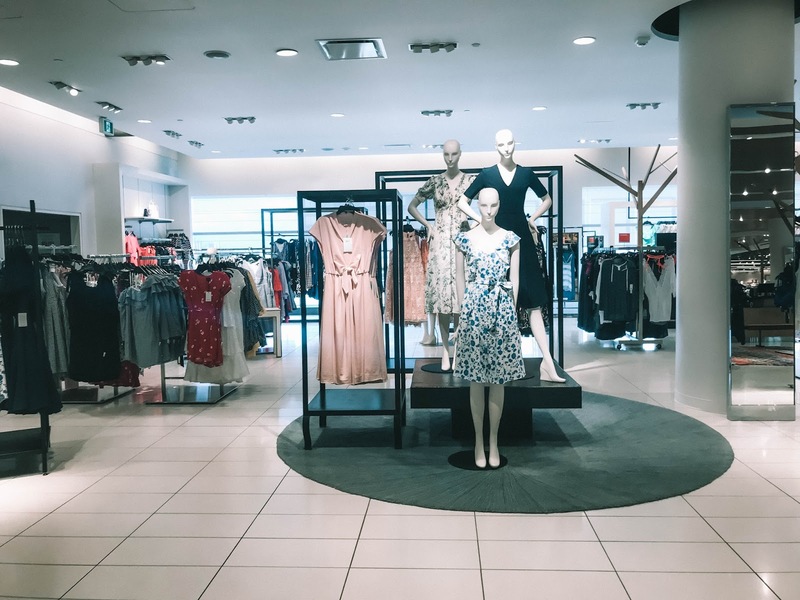 Online window-shopping has become a daily ritual during my lunch break, and a few things have lingered in my brain for when my spending ban is no longer in place. One of the things that this "project" has helped me with is to temper the impulse to immediately buy something if it's pretty. Not that I was necessarily super-bad for that to begin with, but I certainly had my moments. I'm getting better at suppressing my shopping urges. All good things. So these are some of the things that have stayed on my mind longer than the initial rush of excitement... I think that's a good sign, right? 1. Real Techniques Blush Brush - This one has been on my mind for a very, very long time. I have quite a few RT brushes but this one has remained elusive. I can't seem to find a store that sells the single brushes in Ontario! Any suggestions? 2. The Body Shop Camomile Silky Cleansing Oil - I've decided to at least try using a cleansing oil. If Caroline Hirons says it's okay, then it must be, right? I'm still trying to decide between this one from The Body Shop and the Rice Water Cleansing Oil from The Face Shop - perhaps I'll end up with both? 3. The Body Shop Facial Massager - I saw this on Caroline Hirons' blog a while back, and it looks absolutely divine. Using this with the cleansing oil for a nice facial massage/cleanse sounds heavenly. It looks a bit scary, but Caroline actually posted a short video of herself using it and it looks to be quite tame and lovely. 4. NYX Mega Shine Lipgloss in Beige - My local PharmaPlus has revamped their NYX section (yet again) so I've been pretty keen on expanding my NYX collection, which is currently very small. This lipgloss seems to get a lot of coverage in the blogosphere, so I think it's time to see what all the fuss is about! 5. Clinique Long Last Soft Matte Lipstick - This is definitely a Laura/BuyNowBlogLater lemming want. She (and a billion other UK bloggers) posted about this launch a while back. She showed us Petal and Suede and I want them both, and maybe some more. I haven't been a huge Clinique person since their 3 step skincare system destroyed my skin, but I don't think lipstick can do much harm in terms of acne. Somehow I cannot seem to find these exact shades in Canada - perhaps they are called something different here? Or we're eons behind the rest of the world? 7. Yves Saint Laurent Baby Doll Kiss & Blush - Doesn't matter what colour (well, maybe not fuchsia or neon orange) but I want to try these out so badly. Naturally, they're obscenely expensive so I'm very hesitant, but they're on my list anyway because the urge is there and has been for a long time. I'm in it mostly for the blush, to be honest. And I'm willing to shell out for blush. 8. 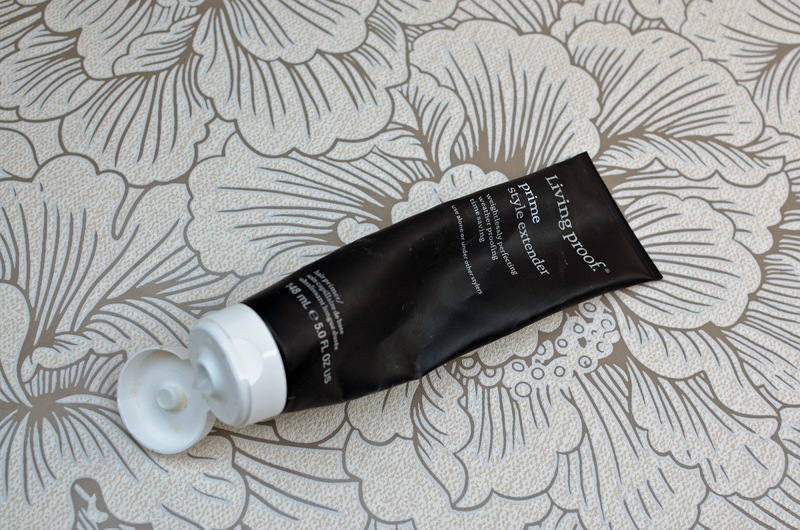 Clarins Extra Comfort Foundation - Another want influenced by Laura. All I've heard are raves about this stuff, and I've been wanting to get myself a sample of 103 Ivory, but the testers have been mysteriously missing every time I go to the Clarins counter. A sales associate once tried to convince me that 107 Beige would work for me and I had to stifle a snort and eye-roll as she tried feverishly (and unsuccessfully) to blend it into my wrist. Let's get serious here. Packing my toiletries for a trip always manages to stress me out, no matter how long the trip. I usually end up taking the same amount of stuff (with a few variations), whether the trip is 2 days or 2 weeks, but actually deciding what to take always gives me pause. Will I actually bother with a full makeup look on this trip? Do I really need a full-sized eyeshadow palette? The answer to questions like that usually ends up being a big "no" - but I still want to look presentable and feel good... so what's a girl to do? 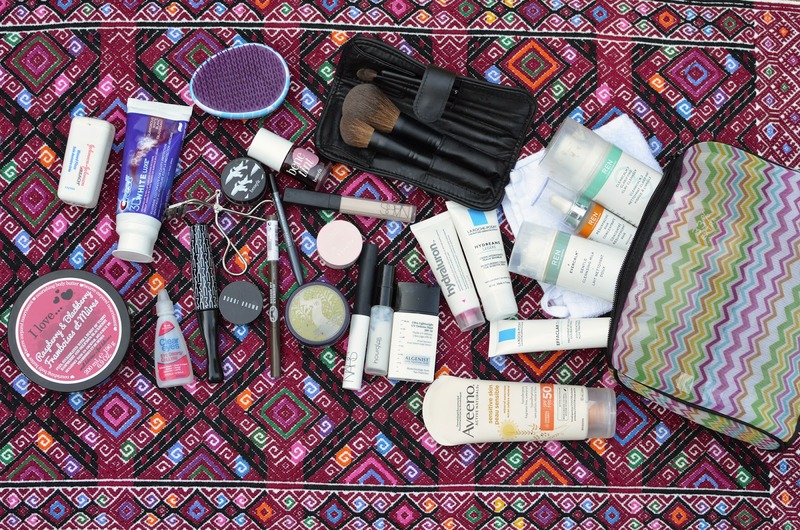 Skincare is key for me; I pack all of my essentials and leave nothing behind. 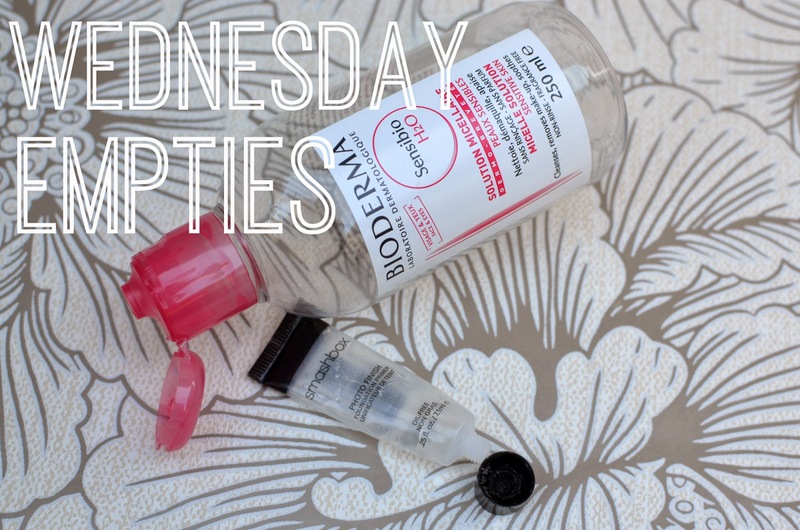 My cleansers, creams and serums take up most of the space allotted to beauty and grooming, which is fine by me! My morning cleanser, my evening cleansers (yes, two different cleansers! ), my morning serum, my evening serum, my moisturizers, my sunscreen... you feel me? All critically important. 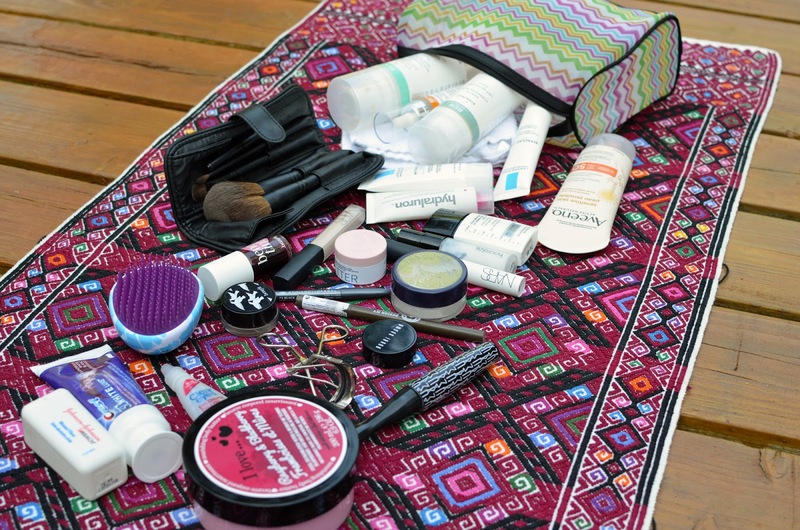 As for makeup, multipurpose is key, as are products that don't require extra tools i.e. Benefit's Benetint and RSVP cream eyeshadow. This was a very short trip, so I went for minimalism this time and only brought a primer, concealer, and powder... and crossed my fingers that my acne situation wouldn't get too out of hand. This was also the first true test of my Sephora travel brush kit. It comes to work with me every day, but this was the first time where it has been all I have. I ended up using everything I brought, which is pretty rare for me to be honest. Everything had a purpose and I didn't bring anything frivolous like 3 different blushes and 4 different lipsticks. It all made sense, and I'm still feeling pretty great about it. Well done self - this is what shopping your stash is all about. In case you weren't aware, I'm on a month-long no-buy for August. No makeup, no clothing, no accessories. Nothing. It has been a bit of a struggle but I think I'm going to feel great about my accomplishment come September 1st, and who knows, I may have re-discovered a bunch of gems in my collection by then! How are you at packing for travel? I'd love to hear some of your tricks to avoid over-packing, as I'm not so sure I'm out of the woods on that problem quite yet. Who knows, this could have been a total fluke! Something you may not know about me is that I love yoga. I have class that I love that I go to every week, and it just makes everything infinitely better. My flexibility, while not terrible to begin with as I have a dance background, has improved as well as my overall strength and tone. Yoga is definitely my jam. Something I found a bit difficult to navigate at first was what to wear. Much like wearing the proper clothing while sweating on the Stairmaster or doing deadlifts, the functionality of your yoga clothing is really important. After nearly two years of dedication to my yoga practice, I've come to learn a lot about what I like, don't like, and need in my yoga wear... and I think I've finally found everything I've been looking for. For starters, I hate wearing long yoga pants. I'm a heavy sweater, so having long pants on just makes things worse. I've experimented with crops (still too sweaty most of the time), and some pretty short booty-shorts (imminent danger of wardrobe malfunctions for open-legs poses) and I've finally settled on this bike-length short from Lululemon. I believe Aritzia does a short in a similar length, but there's something really nice about the fabric and shape of these shorts that I really love. The inseam is long enough to ensure full coverage, even when in poses like pigeon, but short enough to ensure I keep cool. I'm not as picky about what I wear on top, but this shirt from Aritzia's TNA line really does it for me. I have quite a few tight and strappy yoga tops, which I'll sometimes layer under this one, but to be honest I really love the loose and flowy feel of the fabric, and how it looks in contrast to the tight shorts. It's airy enough to be cool, but offers enough coverage that I don't get cold during Shavasana. It can ride up in poses like downward dog (my goodness are my hamstrings ever tight today!) but it's nothing a decent sports bra underneath can't fix. Nobody's looking at you during yoga anyway. Or they shouldn't be, at least. I realize short spandex shorts are not everyone's cup of tea, but after trying essentially everything else, they're my #1 choice for yoga. The Gap makes a great cropped legging, while Aritzia does some good and inexpensive full length leggings as well. 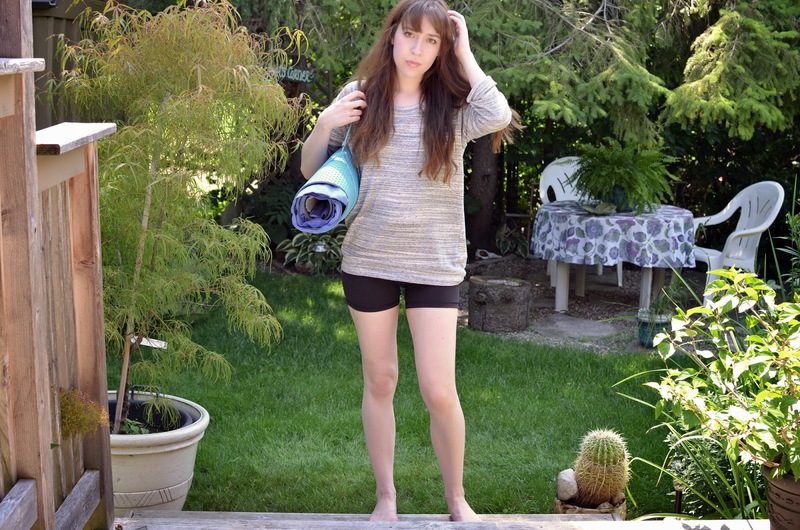 It's all about your own comfort - if what you're wearing for yoga doesn't feel quite right, then change it! I feel like there's such a space in the market for workout clothes right now - Lululemon is (sadly) on its way down, but some other brands like The Gap and Joe Fresh are really stepping up their game. What's your favourite yoga or workout gear? Anything completely random that you were pleasantly surprised by? 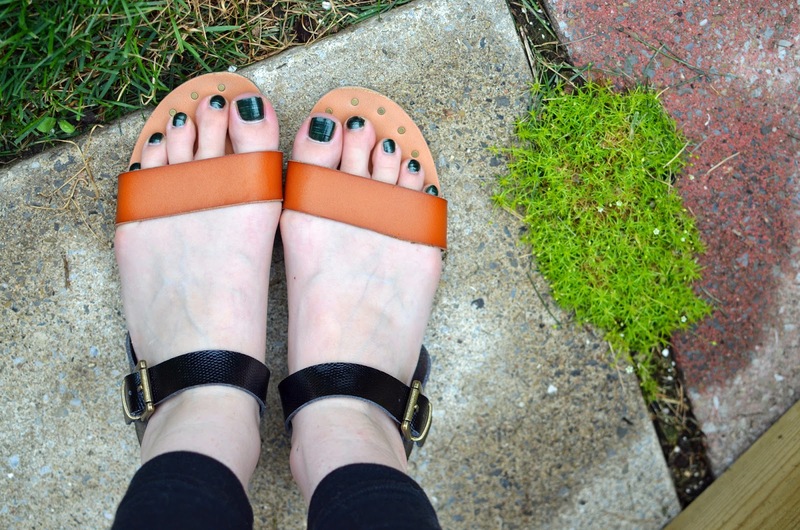 I had mentioned in a post not too long ago that my summer sandal situation was in quite a sorry state, and that was honestly no exaggeration. One pair of sandals was all I had, and they weren't the kind that goes with absolutely everything. I needed some options, stat. Enter Target, and their crazy shoe clearance sale. Granted, these aren't leather, but they're a decent enough fake that they required absolutely zero breaking-in before a full day of wear. My usually delicate feet were totally fine after pounding the pavement downtown for a day of playing tourist in my own city. For that alone, these get a huge thumbs up. But it gets better: they were on clearance for $9.99... and their regular price still fits into the 20 under $20 category at $19.99. Solid, right? 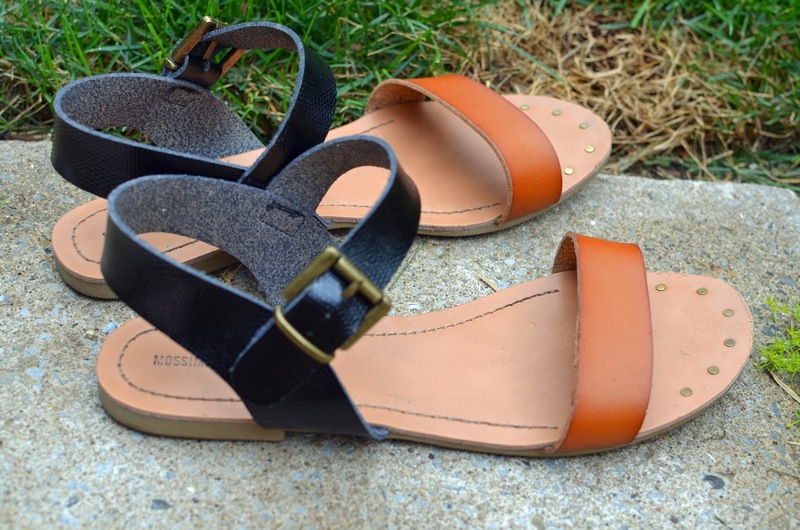 I'm sure they'll have fallen apart by next summer, but they've been a great quick fix for my sandal situation this summer! I grabbed another pair of sandals from the same sale, slightly more dressy, but these have really knocked it out of the park. Brown and black, so they go with pretty much everything - so versatile and so easy! For some reason they're not on sale online, but if your local Target has their shoe sale still going, these may very well be hidden in the racks! Hope you're all having a lovely weekend! It's been raining all week here, but the sun has finally come out today - time to put these babies on and get going!